Adveco Ltd. is a supplier of a wide range of heating and hot water appliances and equipment including a diverse range of water tanks to serve both heating and domestic hot water systems as buffers, indirect, or direct water heaters. All Adveco products are designed and tested to the highest quality standards to ensure lasting performance and safety. Please navigate to the desired product range by selecting a category from the below options. Stainless steel domestic hot water vessels from 200 to 2500 litres, available as buffers, indirect or direct water heaters. 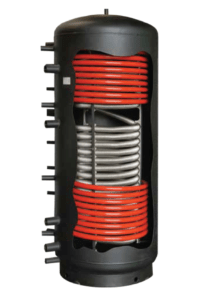 Primary system buffer vessels from 500 to 10000 litres, suitable for a wide range of applications with options for internal heat exchange coils. Carbon steel thermal storage vessels from 600 to 2000 litres, suitable for combined heating and DHW applications. Carbon steel chilled water vessels featuring elastomeric foam insulation to prevent condensation.